Liar’s Dice is one of the best games ever invented. It is a fast-paced game involving luck, probability & bluffing. It is easy to learn — you don’t need to be particularly good at math. If you can divide 24 by 3 in your head, you will do just fine. And most 12-year-old kids should become proficient after 2 minutes of instruction. If you are unfamiliar — check out this Wikipedia article. Or better yet, watch Captain Jack Sparrow challenge Davy Jones to a round of dice in this brief clip from Pirates of the Caribbean. I first played Liar’s Dice in 2008, I’ve since introduced it to dozens of friends. Anecdotally, but almost universally — everyone I’ve taught has also become an evangelist. The game is easy to understand but hard to master. It is very much so like Texas Hold’em Poker, but easier and things move much faster. Unlike Poker, Liar’s Dice works well from an audience standpoint. Because there is constant, visible action, it is easy to cheer on from the sidelines and share in the glory. I’d bet that in the past year, at least 50 million people globally have played Liar’s Dice. The game originated from Latin America. And you can find it played every day in hundreds, if not thousands of bars across Asia. As a point of comparison, PokerStars was acquired for $4.9bn in 2014 — and is estimated to control 70% of the market. Which means that the market for online poker is $7.0bn give or take. That could be the market for Liar’s Dice — if not larger. After all, both games require a similar combination of luck & skill, but one is easier to learn, faster-paced and more social. There are two paths you could take to monetize this game. Path #1: Work with brick & mortar casinos. Casinos are open to testing new games. However, to go from concept to the pit floor, the process takes over 5 years and around $500,000 to cover various legal & other fees. According to this article drawn from the work of Eliot Jacobson, a math PHD and one of the world’s leading experts in casino games, there are several criteria that any new casino game requires to be successful. I’ve listed what I believe to be the 4 most relevant criteria for Liar’s Dice. However there is a catch. Even if you invested the time & money, and Liar’s Dice Casino Edition became a success, I’m not sure how defensible the core intellectual property would be. After all, Liar’s Dice dates back to the era of Pizzaro and the conquistadors (Although the exact origins are contested, it seems incontrovertible that the game is several centuries old). You could probably design & patent a special table + camera contraption that is optimized for Liar’s Dice. This would earn you some royalties, and you could build a consulting business around it. Liar’s Dice Casino Edition may generate billions for the casinos. However, if you were only to focus on brick & mortar casinos, my guess is that your entrepreneurial upside is capped in the tens of millions. It could no doubt still be a great outcome, but you should just understand that such a prospect alone wouldn’t attract traditional venture capital funding. Perhaps you could obtain funding via angel investors or the innovation arms of the casinos themselves. There are already several existing Liar’s Dice apps. I downloaded the first one which had by far the most reviews, and gave it a test run. Upon first glance, it’s actually a nice-looking, highly functional app! It’s only been around for a few months and has an audience of what I estimate to be several thousand daily active users. I chatted with the founder of YoAmbulante, the company which made the game, who mentioned that it was made by a team of 5 experienced game developers. Pretty impressive, and I’m sure that his app has a lot of untapped potential. 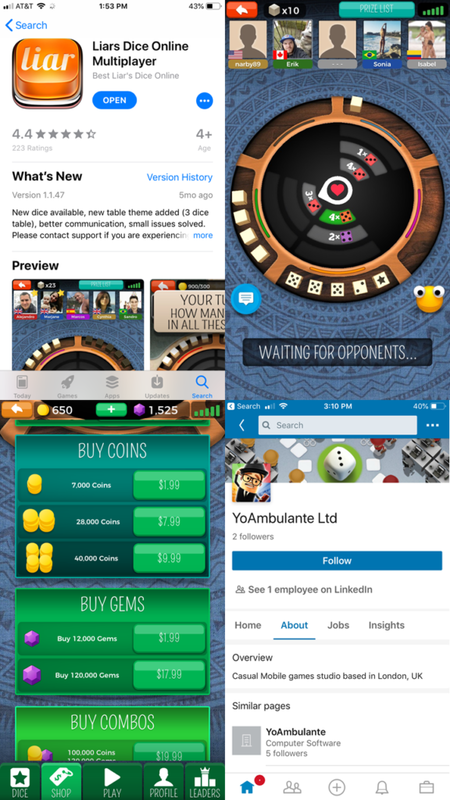 A relatively simple experiment I would do if I were YoAmbulante (or had my own Liar’s Dice app) is to add $100 daily tournaments. Such tournaments would be free to enter, and a different winner would win $100 every day. You wouldn’t need regulatory approval because people aren’t gambling — they are playing for free with the opportunity to win a cash prize. Similar to HQ Trivia — this would build a habit amongst users and generate virality. And of course, there would be some spillover growth for your in-game purchases. Last summer, my friend built another gaming start-up around free daily tournaments with real cash payouts. And I saw this working up close and in real-time. Liar’s Dice would be perfect for the daily, free-to-play, cash tournament model given the easy-to-learn, fast-paced, and social nature of the game. Ultimate success: Becoming the PokerStars of Liar’s Dice. In the long run, to capture the $7.0 billion opportunity for Liar’s Dice, you need a digital platform that provides gambling capabilities. This requires a whole host of new features such as collusion detection, ID verification, billing, privacy, compliance, and customer support. And of course, you would need the appropriate gambling licenses. None of the above comes cheaply, but either Path 1 or 2 could be a great proof of concept and fund the long-term vision. If you are interested in this area or are already working on something related, please reach out. And I’ll try my best to connect you with the resources & people you need. I’d love to see Liar’s Dice become more mainstream — no matter who creates it. I’ll certainly play it myself. But as they say — the house always wins, so I’d rather work with the house =).